Exoskeleton Market size was valued at over USD 220 million in 2018 and will witness around 41.5% CAGR up to 2026. Increasing patients with body movements disorders such as Parkinson’s disease, multiple sclerosis, and strokes are major factors accelerating product demand. These diseases limit voluntary body movements and create problems in routine activities. Over 1 million people are diagnosed with Parkinson’s disease every year in the U.S. alone. Rising population with movement disorders will accelerate the exoskeleton market share over the forecast timeline. Rising aging population across the globe will propel the industry growth. According to the World Health Organization, the world’s population above 60 years will rise from 12% in 2015 to around 22% in 2050. Muscle strength and physical labour capabilities deteriorate with the increasing age. Growing adoption of medical devices to support and actuate body movement will propel the exoskeleton market growth through the forecast period. Exo-suits aid in lifting and reducing the stress on user’s body parts such as back muscles and spine. Manufacturing facilities are adopting tool handling exoskeletons, powered gloves, and body-powered suits to decrease fatigue while working for an extended time period. Proliferating demand for wearable suits in manufacturing & construction sectors to improve productivity and reduce injuries & fatigue will escalate exoskeleton market size. Ongoing technological innovations to reduce the overall weight and ease motion will drive exoskeleton market share. Industry participants are working with research agencies such as Wyss Institute and Harvard Biodesign Laboratory to develop advanced suits with multiple gait patterns. In May 2016, Wyss Institute and ReWalk Robotics collaborated to develop lightweight soft exosuits for assisting people with lower limb disabilities. Industry participants are continuously investing in R&D to develop exoskeletons that are light-weight and offer improved mobility. For instance, SRI International is developing a low cost SuperFlex exosuits for usage across multiple industries including healthcare and military manufactured with 4D materials. 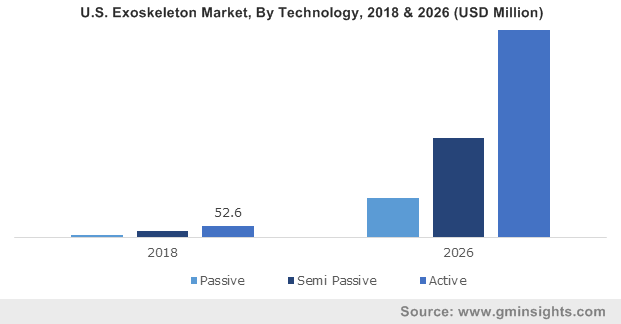 Proliferation of advanced technological sensors and integration of big data and AI technologies will provide potential growth prospects for exoskeleton market size till 2026. Higher initial product development cost will limit the industry growth over the projected timeframe. Incorporation of multiple sensors and motors into the exoskeletons contribute significantly toward increasing the overall product cost. Moreover, research regarding the fusion of appropriate software and hardware for calibration and customized usage further increase the cost significantly. Lowering production costs along with proliferating innovations will play significant role in achieving the economies of scale over the forecast period. Stationary exoskeleton market segment will witness significant gains with the growing rehabilitation programs. It provides power assistance to weekend limbs and help the body parts to get stronger. In December 2014, Spaulding Hospital launched a rehabilitation program for patients with spinal cord injuries. Moreover, industry participants, such as Hocoma, are initiating rehabilitation programs through Virtual Reality (VR) to increase motivation. Growing awareness through such programs will drive consumer inclination over the forecast timeframe. Mobile exoskeletons market segment is expected to hold its dominance through the forecast period as they provide free body movement. The product supports powered hip and knee motion to enable individuals with spinal cord injuries to stand and walk. The systems are installed with battery packs, motors, and controllers fitted in limited and compact space. Rising demand for industrial & military exoskeletons to support body motion and reduce fatigue will drive the industry growth through the forecast period. Healthcare sector is expected to dominate exoskeleton market through the forecast period. This can be primarily attributed to the growing adoption by aged people and patients suffering from mobility disorders. Industry players are developing wearable devices focused on a body part. For instance, in May 2018, Cyberdyne with Brooks Cybernic Treatment Center designed Hybrid Assistive Limb (HAL) for patients with lower limb disorders. Further, the company secured the FDA approval to offer its products in the U.S. through licensed medical facilities. Industries such as manufacturing, dry-docks, warehouses, and factories are equipping laborers with wearable suits to increase alertness and work efficiency. The exoskeleton reduces work-related injuries, reducing medical expenses, leaves, and lawsuits. Facilities are utilizing powered mechanized gloves and tool holding systems to support heavy tools. Active exoskeleton market segment held dominant share owing to its applications to actuate body motion in patients suffering from physical disabilities. The system installs batteries and electrical connections to run sensors and actuators. These exosuits utilize human interface for motion capturing and force interaction. Active exoskeletons are hydraulically or pneumatically actuated with force and pressure sensors in the circuit. The rising demand for such suits for healthcare and industrial applications will propel segment growth over the study timeframe. Passive exoskeletons have witnessed significant adoption to hold heavy tools & machinery in conjunction with the national security. The suits redistribute object weight and act as shock absorbers and vibration reducers. Military agencies in collaboration with research institutes and manufacturers are developing simple and lightweight systems. For instance, in July 2015, the Australian Department of Defence developed a fully-passive system capable of reducing compression forces on the lower portion of the body. U.S. exoskeleton market is expected to hold dominant industry share through the forecast period. It can be attributed to the high adoption rates in conjunction with the significant presence of major industry players including ReWalk, Ekso Bionics, and Lockheed Martin. Rising military spending on the development of innovative equipment to strengthen the armed forces capability will drive the product demand. In June 2018, the U.S. Army Natick Soldier Research, Development, and Engineering Center developed ONYX to lighten the combat load. Additionally, rising demand from clinics and rehabilitation centers will ensure their dominance over the forecast period. Europe held the second largest industry share in 2018, predominantly due to high penetration of the elderly population in the region. In 2017, people aged 65 and older accounted for over 19% of the overall population with an increase of around 2.4% in the past ten years. Ageing population is prone to suffer from multiple impairments and face difficulties in performing with natural gait. Exosuits provide support to muscles and assist in gait functions, proliferating the manufacturing sector and positively influencing the industry growth. 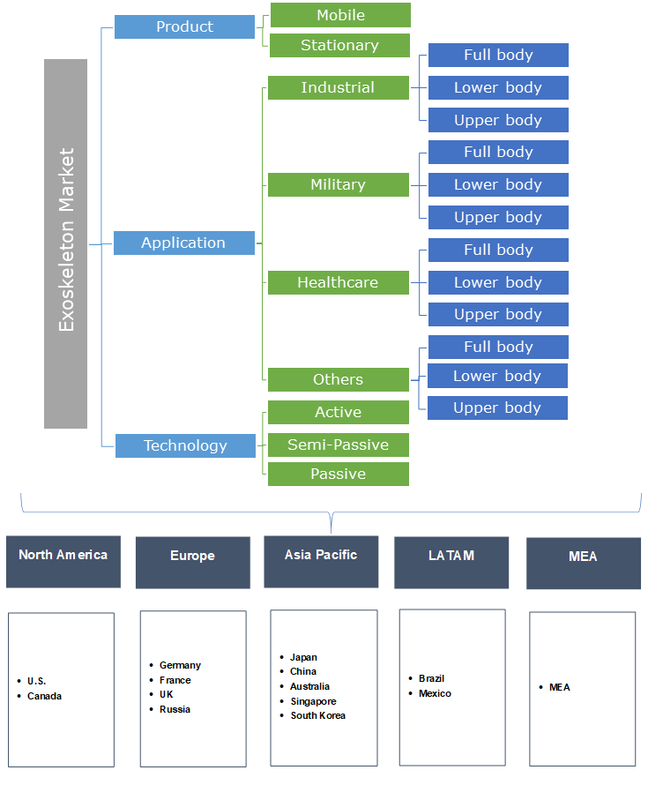 Some of the key manufacturers in the exoskeleton market share include Lockheed Martin Corporation, Parker Hannifin, ReWalk Robotics, REX Bionics, Ekso Bionics, and Cyberdyne. Few other ecosystem participants include ATOUN Inc., Hocoma, Revision Military, Wandercraft, and Honda Motor Co. Ltd.
Industry participants are engaged in strategic collaborations with research organizations for developing exosuits. For instance, in 2018, Lockheed Martin announced a strategic partnership with Deakin University Institute for Intelligent Systems Research (IISRI) for developing industrial products to expand their product portfolio. Industry participants offer their exoskeleton products through their robust distribution channel for increasing their market share and meet the growing consumer demand. Industry participants are involved in strengthening their distribution channels for enhance their target consumers base including military, industrial, and healthcare, thereby streamlining their operations and support in revenue generation. For instance, in 2015, ReWalk Robotics announced an Australian Distribution Agreement along with TGA Approval for distributing their solutions to the Australian Spinal Cord Injury Community. Historical data coverage: 2014 to 2018; Growth Projections: 2019 to 2026.